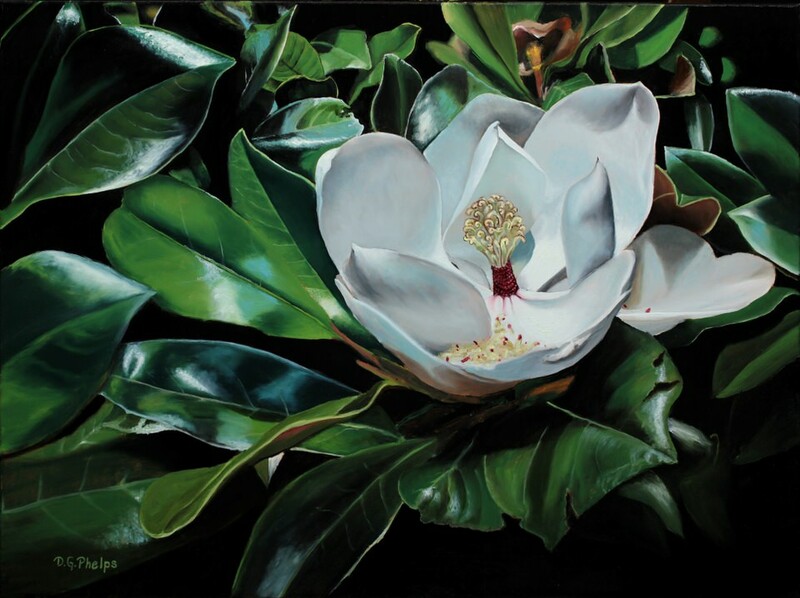 Magnolia Flower Painting and some history behind this southern favorite. 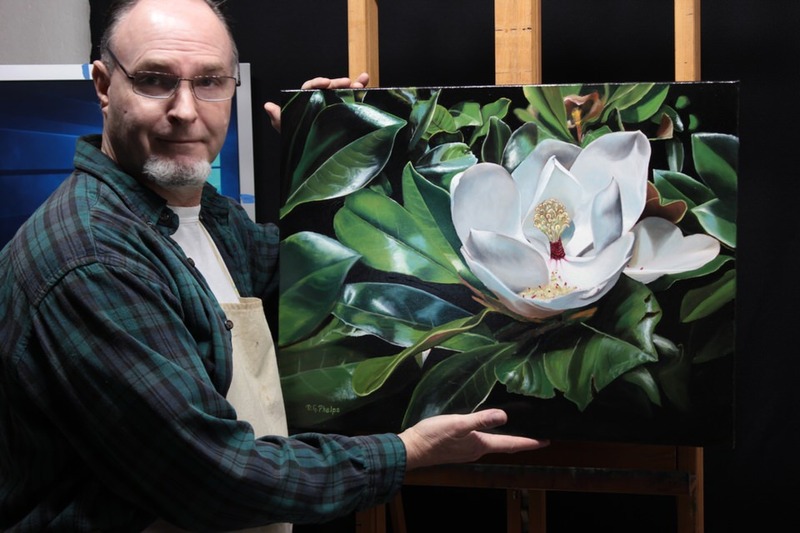 "Magnolia Glory", a magnolia flower painting and a history of this tree blossom. A southern favorite, the magnolia flower blossom. Taking a trip somewhere always involves my camera. On a recent trip, we discovered a number of blossoms on this single Magnolia Tree. After taking a number of pictures, I couldn't wait to get back and get started in painting one of the blossoms. Alas, no single photo seemed to work in terms of size and composition, so, my secret weapon, photoshop 101 to the rescue! Actually, I don't use photoshop. What I do, is line up my references and create an initial drawing taking pieces of each photo that I like. When painting starts, I move from one reference photo to the next as the painting develops. In this particular work, the blossom was perfect, as were the leaves immediately outside the edge of the blossom, then things got ugly. Borrowing leaves from other references, I was able to come up a compositional wonder, and proceeded in starting with drawing in the major edges of each object. 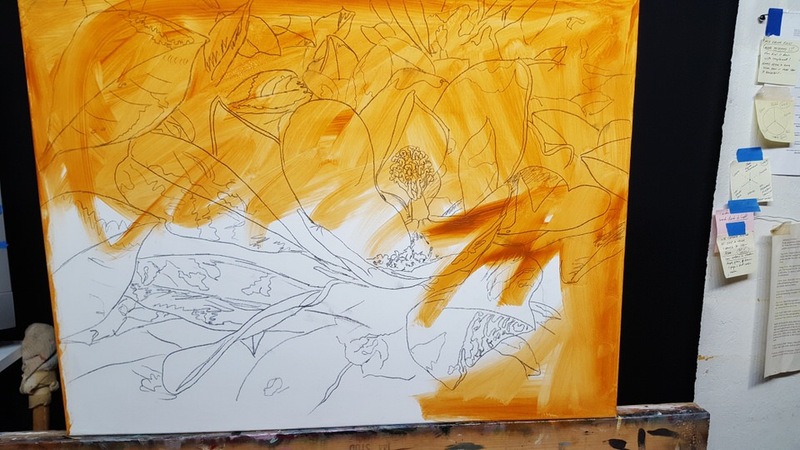 Below is a photo of the drawing and toning of the canvas. Magnolia flower isn't a flower! Magnolia grandiflora, southern magnolia or bull bay. A tree of the family Magnoliaceae native to the southeastern United States, it is one of the most magnificent of the fragrant trees. It has large, thick, leathery dark green leaves which are up to 10 inches long. In the spring, they have a golden to rust color on their undersides. The large evergreen trees may grow to 90' tall, and the fragrant white magnolia flower blossoms that have a smooth, almost velvet-looking petals are 8-12 inches across. It is the state flower of both Mississippi and Louisiana. Mississippi is called "The Magnolia State" because it is our state flower, and because of the large number of natural growing magnolia trees. Here in Virginia, they thrive. When in the Spring these beauties begin to blossom, I ride around on my motorcycle with camera close by to capture them early and record my route. As the days go by, more and more will blossom out, and I'll catch many fully open magnolia blossoms throughout their blooming stages. From particially open, to spent blossoms, they all are beautiful. The magnolia flower has been the subject of paintings for hundreds of years. Around here, because of their flagrance, and size, they work well as dining room center pieces. 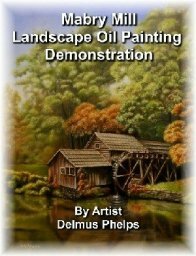 Click here for more info on my painting method and guarantee. Check my Etsy Page for this paintings availability. They sell quick, but I paint full time, so you may see new works often, and with all the magnolia trees we have here in Lynchburg, I'm sure a new one will make it to the canvas soon. If you're in a real hurry, contact me for a commission quote. You will be pleasantly surprised at the affordability of original art.